Description - Since its conception, our Premium Indoor Sports Tiles have been used in the harshest environments to provide an easy to install, low-maintenance, flooring solution for multi-purpose areas. A 10-year warranty backs These sports floor tiles and offers excellent traction and comfort. Being a highly customizable, portable floor tile with a smooth surface, these tiles are highly sought after for trade show flooring, inline hockey court flooring and much more. Recommended Uses - -Our Premium Indoor Sports Tiles have been manufactured to be truly versatile tiles that have been installed as basketball court floors, flooring for volleyball courts, gymnasium flooring, rec room flooring, inline hockey rink flooring, flooring for badminton courts, outdoor deck flooring, patio flooring, flooring for shuffleboard courts, and anywhere else a long lasting, smooth surface tile is desired. Simply hose down the floor and let the self-draining design allow for the dirt and debris to be swept away. When installing the ProGym tiles, we recommend starting in one corner of the room and working your way out from there. When you come up to an edge, wall or object, don’t worry. Just measure the area and cut the tiles with a sharp utility, tile cutter, or table saw. Don't see the color you're looking for? Call for additional colors. Beveled edging for safe thresh-holds available. Smooth surface for unsurpassed traction. Do regular hockey pucks slide across this? 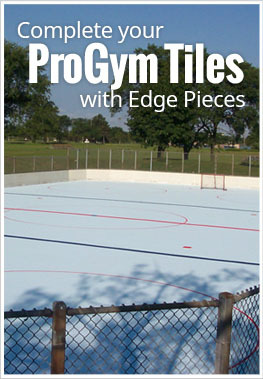 Regular hockey pucks can slide across our Premium Indoor Sports Tiles. What happens if a liquid gets on this type of flooring (someone spills a drink, etc)? Thanks. If you spill a liquid on our Premium Indoor Sports Tiles, nothing happens to the tiles. The tiles are non-porous so the liquid will just sit on top of the tiles. We do recommend cleaning up spills promptly as they can become a slip hazard for anyone playing on the surface. Does this floor need an underlayment? Do you have options for lines and cut outs for volleyball etc.? Our Premium Indoor Sports Tiles don't need to be installed with an underlay, but we do suggest one for added comfort and bounce. The underlayment acts as a shock absorber helping to protect your joints while at play. You can paint lines onto your floor, or you can use tape. We recommend using a two-part polyurethane paint to paint lines on your court. For any cut outs, you can use our tile cutter or a table saw to create the cutouts that you need. What is the difference in the regular indoor sports tiles and the premium sports tiles? Also, can the titles be placed on current gym floor tiles or will we have to pull the floor up? The main difference between the Premium Indoor Sports Tiles and the Indoor Sports tiles is that the Premium version has more color options. They are both made from the same material and perform the same. The tiles can be placed on any existing flooring that is flat. There is no need to remove the existing floor.